Based on the results of a new study, researchers are developing a clinical trial to test imatinib(Gleevec) in patients with anaplastic large cell lymphoma (ALCL), an aggressive type of non-Hodgkin lymphoma that primarily affects children and young adults. The researchers found that a protein called PDGFRB is important to the development of a common form of ALCL. PDGFRB, a growth factor receptor protein, is a target of imatinib. Imatinib had anticancer effects in both a mouse model of ALCL and a patient with the disease, Dr. Lukas Kenner of the Medical University of Vienna in Austria and his colleagues reported October 14 in Nature Medicine. VIEW VIDEO by Mayo Clinic Dr. Tim Call describes Chronic Lymphocytic Leukemia (CLL), its diagnosis, and treatment options for patients with CLL. Commentary re: A. N. Mohamed et al., The Effect of Imatinib Mesylate on Patients with Philadelphia Chromosome-positive Chronic Myeloid Leukemia with Secondary Chromosomal Aberrations. Clin. Cancer Res., 9: 1333–1337, 2003. CML3 is a myeloproliferative disorder with an incidence of approximately 1–1.5 cases/100,000 population/year, a slight male predominance, and a peak between 50 and 60 years of age (1) . This condition arises from a transformed pluripotent hematopoietic precursor associated with t(9;22)(q34;q11.2) that gives rise to the Ph′ chromosome. At the molecular level, this cytogenetic aberration results in the fusion of the ABL gene at chromosome band 9q34 with the BCR gene at chromosome band 22q11.2. The resultantBCR/ABL fusion gene encodes a chimeric protein necessary and sufficient to confer the leukemic phenotype. In a minority of the cases, despite absence of the Ph′ chromosome, molecular methodologies (i.e., fluorescence in situ hybridization, Southern, or RT-PCR) can still detect BCR/ABL as the product of complex cytogenetic aberrations involving other chromosomes in addition to 9q34 and 22q11.2, or cryptic genomic rearrangements of the BCR and ABL genes. Taken all together, >95% of the CML cases are associated with BCR/ABL expression that, therefore, represents the hallmark of this condition. CML is a bi- or triphasic disease (2) . Patients usually present in a chronic proliferative phase characterized by splenomegaly and accumulation of neutrophils in their various stages of maturation. Basophils and blasts are normally <20% and 10%, respectively, in CP CML. Evolution to the BP (or blast crisis) is defined by an increase (≥20%) in myeloid or lymphoid blasts in blood, BM, or extramedullary locations. In many cases, the transformation is characterized by a passage through an AP, in which the failure of a patient to respond to therapy is accompanied by an increase in percentage of blasts (10–19%); a ≥20% increase in basophils, uncontrolled thrombocytosis, or thrombocytopenia; and acquisition of new cytogenetic abnormalities such as trisomy 8, isochromosome 17q, or a second Ph chromosome and/or genetic inactivation of the p53 gene. The ultimate goal of treatment for CML is prevention of blast crisis, because, once this occurs, the prognosis is dismal. Although a rapid reduction of the white cell count can be achieved with chemotherapy (i.e., busulfan or hydroxyurea) in CP CML, these drugs usually fail to prevent disease progression. IFN-α was the first agent proven capable of modifying the biological history of CML by prolonging survival in patients who achieved CHR and MCR (<35% of Ph′+cells; Ref. 3 ). A second breakthrough in the treatment of CML occurred when 60–80% of patients undergoing alloBMT in CP were reported to be disease free at 5 years (4, 5, 6) . However, both IFN-α and alloBMT have considerable treatment-induced toxicity that attenuated the initial enthusiasm for these results, and novel, less toxic therapeutic strategies are being explored. In 2001, Druker et al. (7)reported the first Phase I study with imatinib mesylate (STI571, Gleevec), a specific inhibitor of BCR/ABL oncogenic activity. In this study, the authors demonstrated that high rates of CHR and MCR were achieved with relatively few side effects in patients with CML refractory or intolerant to IFN-α, opening new avenues for molecularly targeted therapies in this disease. Subsequently, encouraging results were also obtained for CML patients in BP (8) . Is BCR/ABLthe Driving Force for Leukemogenesis in CML? The transforming activity of BCR/ABL has long been demonstrated using in vitro and in vivo models. In initial studies, transfection of the BCR/ABL gene fusion resulted in malignant transformation of normal fibroblasts, and induced independent survival and proliferation in growth factor-dependent cell lines. 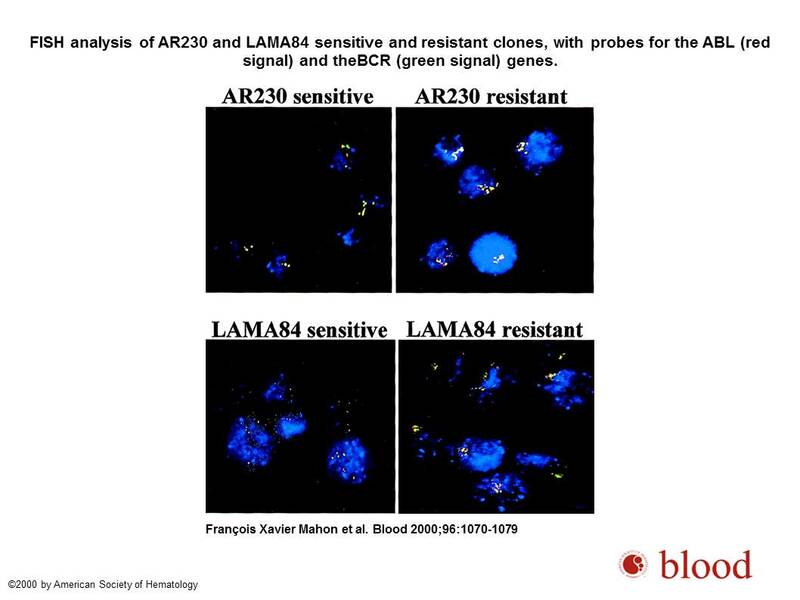 Expression of BCR/ABL was also shown to be necessary and sufficient to induce leukemogenesis in animal models (reviewed in Ref. 9 ). Expression of BCR/ABL in mice was achieved by either introduction (“knock-in”) of the fusion gene in the mouse genome or by infecting murine stem cells with BCR/ABL-containing retroviral vectors. In knock-in transgenic mice with conditionalBCR/ABL expression, a low penetrance phenotype of acute B- or T-cell leukemia was reported. In contrast, in mice sublethally radiated and transplanted with syngeneic retrovirally transfected BCR/ABL+ stem cells, a condition mimicking human myeloproliferative disorders with neutrophil increase, BM expansion, hepatosplenomegaly, extramedullary hematopoiesis, and pulmonary leukostasis was observed. How Does BCR/ABL Transform Cells? The fusion partner ABL is a member of the nonreceptor tyrosine kinase family (10) . This gene encodes a protein containing a tyrosine kinase activity domain (SH1) in addition to two other regulatory domains (SH2 and SH3) that mediate protein-protein interaction and modulate activation of signal transduction. A nuclear localization domain is also present, supporting a shuttling activity of the ABL protein between cytoplasm and nucleus. Genetic disruption of ABL in mice results in lymphopenia, runting, and perinatal mortality. The other fusion partner, BCR, is a protein with multiple functional domains involved in oligomerization, SH-2 binding, serine/threonine kinase activity, and activation of members of the Rho small GTP-ase family of proteins (10) . Structural analysis of this gene suggests a role as a mediator of signaling transduction. With targeted disruption of BCR, mice have increased susceptibility to septic shock, but normal hematopoiesis. In CML, each of the two partner genes are disrupted at specific breakpoints and fuse to create the chimeric BCR/ABL gene (11) . The most common rearrangements give rise to fusion transcripts identified as b2a2 or b3a2, which, in turn, are translated into a 210 kDa protein. Alternative BCR breakpoints can be located in minor cluster (m-BCR) or micro (μ) cluster (μ-BCR) regions and result in fusion transcripts that encode smaller (190 kDa) or larger (230 kDa) products, respectively. Although usually associated with Ph′+ acute lymphoblastic PiQO leukemia, the protein can also be detected in ≥90% of the CML patients from alternative splicing of p210. p230 is instead usually associated with CML patients presenting with an unusual predominance of neutrophils, resembling chronic neutrophilic leukemia. In each of these BCR/ABL variants, the ABL tyrosine kinase domain autophosphorylates and becomes constitutionally activated. Such BCR/ABLderegulated tyrosine kinase activity is, in fact, responsible for transformation of the hematopoietic stem cell and maintenance of the leukemic phenotype by recruiting and activating transducing signal pathways (i.e., RAS, RAF, extracellular signal-regulated kinase, c-Jun NH2-terminal kinase, phosphatidylinositol 3′-kinase, cCbl, CRKL, Janus-activated kinase-signal transducers and activators of transcription, PKC and PLCγ) involved in: (a) enhanced gene transcription (i.e., c-myc, c-Jun, reviewed in Ref. 12 ); (b) altered mRNA processing, nuclear export, and translation (i.e., bcl-xL, CAAT/enhancer binding protein α, and p53; reviewed in Ref. 13 , 14 ); and (c) increased or decreased protein stability (i.e., Abi proteins; DNA-PKcs; FUS, and hnRNP A1; reviewed in Ref. 13). This, in turn, leads to enhanced proliferative potential and survival, altered motility and trafficking, and suppression of granulocytic differentiation (1 , 13 , 15 , 16) . BCR/ABL is an ideal target for molecular targeted therapy, because this fusion protein is present in all of the CML cells, is absent from nonmalignant cells, and is necessary and sufficient to induce leukemia. Imatinib mesylate is a 2-phenylaminopyrimidine tyrosine kinase inhibitor with specific activity for ABL, platelet derived growth factor receptor, c-kit, and Albeson-related gene (17) . The pharmacological basis of this interaction has been elucidated by crystallographic studies. Imatinib mesylate binds to the amino acids of the BCR/ABL tyrosine kinase ATP binding site and stabilizes the inactive, non-ATP-binding form of BCR/ABL, thereby preventing tyrosine autophosphorylation and, in turn, phosphorylation of its substrates. This process ultimately results in “switching-off” the downstream signaling pathways that promote leukemogenesis. Preclinical in vitro and in vivo data indicated an impressive selective activity of imatinib mesylate on cells expressing BCR/ABL, and supported a rapid transition of this compound from the bench to the clinic. To date, imatinib mesylate has been evaluated in several Phase I and II clinical trials of patients with IFN-α-resistant chronic, accelerated, or BP CML (7 , 8 , 18, 19, 20) . From the collective analysis of these studies, imatinib mesylate appears to effectively induce high CHR and cytogenetic response rates with relatively few side effects. In patients with CP CML who have failed IFN-α the CHR was 95%, MCR 60%, and complete cytogenetic remission 46%. Notably, in these patients achievement of MCR at the 3-month time point correlated with improved progression-free survival. In AP and in blast crisis, the CHRs were 34% and 8%, MCRs were 24% and 16%, and complete cytogenetic remissions were 17%, and 7%, respectively. Disease progression was 11% at 18 months for CP, 40% at 12 months for AP, and 80% at 18 months for BP. Finally, preliminary data from an interim analysis of a phase III study of untreated CML patients randomized between imatinib mesylate versus IFN-α and ARA-C indicate a significantly better CHR, complete cytogenetic remission, and progression-free survival for the imatinib mesylate group after a median follow-up of 14 months (21) . However, a longer follow-up will be necessary to assess whether this compound can also impact on the natural history of the disease and prevent or delay transformation to blast crisis. During disease progression, CML progenitor cells acquire a number of genetic alterations, most probably because of increased genomic instability, that may explain the aggressive phenotype, chemotherapeutic drug resistance, and poor prognosis of CML in BP. 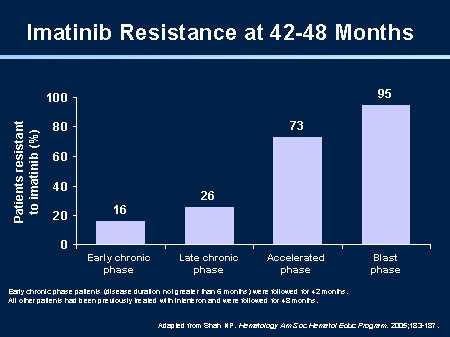 Despite the exciting results obtained with imatinib mesylate noted above, CML patients eventually show resistance at a rate of 80% in BP, 40–50% in AP, and 10% in CP post-IFNα failure, at 2 years (19) . 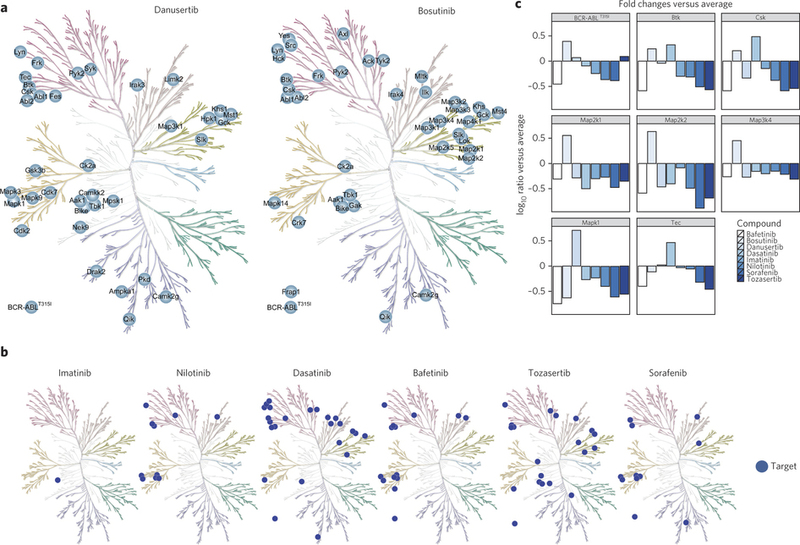 Identification of the molecular basis of resistance is important, because it could provide insight into disease progression and into the design of novel therapeutic strategies to prevent and overcome treatment resistance. CML patients with imatinib mesylate resistance can be stratified into those with primary refractory disease, most frequently in accelerated or BPs, and those who relapse after initial response, who are most frequently in CP. On the basis of the presence or absence of BCR/ABL tyrosine kinase activity in leukemia cells, it is also possible to discriminate between cases with BCR/ABL-dependent and -independent mechanisms of imatinib mesylate resistance. Notably, because the BCR/ABL enzymatic activity cannot be easily measured in blood or BM patient samples, levels of phosphorylation of the BCR/ABL substrate CRKL have been used as a surrogate end point for the tyrosine kinase activity(22) . In patients with higher levels of CRKL phosphorylation despite treatment with imatinib mesylate, resistance has been found to result from at least three different BCR/ABL-dependent mechanisms: BCR/ABL gene amplification, BCR/ABL mutations, and high plasma levels of AGP (reviewed in Ref. 23 ). The association of BCR/ABL gene amplification with resistance to imatinib mesylate is consistent with the reliance of CML blast crisis cells on BCR/ABL expression/activity for their proliferation and survival, and with the reported enhanced expression of BCR/ABL in these cells (24) . Indeed, high levels of BCR/ABL expression, which are detected frequently in CML-blast crisis but not CP cells, appear to be required for suppression of myeloid differentiation and increased resistance to chemotherapy-induced apoptosis ofBCR/ABL-expressing cells. Specifically, high levels of BCR/ABL kinase activity are required for hnRNP E2-dependent inhibition of CAAT/enhancer binding protein α, the major regulator of granulocytic differentiation (25) , and for the La-dependent enhancement of MDM2 expression, which, in turn, results in functional inactivation of p53(14) , also required for myeloid blastic transformation (26 , 27) Although the mechanisms underlying such an increase of BCR/ABL expression are unclear, a double Ph′ chromosome is likely to be responsible for the enhanced BCR-ABL levels in some cases. 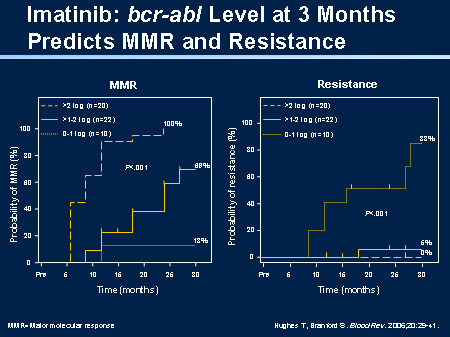 Other mechanisms of imatinib mesylate resistance involve mutations in the BCR/ABLgene itself. Several different mutations have been detected in at least 13 amino acids of the ATP-binding site or other regions of the tyrosine kinase domain, and the list is growing (23 , 28 , 29) . These mutations usually prevent imatinib mesylate from binding to BCR/ABL, thereby resulting in lack of inhibition of the tyrosine kinase activity. Among these mutations, substitution of a threonine to isoleucine at position 315 of ABL that prevents imatinib mesylate from binding to the ATP-binding domain, is the first described and one of the most frequent (22) . A third mechanism of resistance relies on plasma levels of AGP. It has been shown that AGP binds imatinib mesylate at physiological concentrations in vitro and in vivo, and blocks the ability of imatinib mesylate to inhibit BCR/ABL kinase activity in a dose-dependent manner (reviewed in Ref. 23 ). Finally, in patients with primary refractoriness to imatinib mesylate, resistance more often occurs in absence of significant CRKL phosphorylation, suggesting activation of BCR/ABL-independent leukemogenic pathways. Although a longer follow-up is necessary to draw definitive conclusions, these findings suggest that additional cytogenetic aberrations do not appear to impact on disease response, and, therefore, karyotype analysis should not be used to stratify patients for therapeutic alternatives to imatinib mesylate. Furthermore, despite clonal evolution, the oncogenic potential of BCR/ABL appears to remain the driving force for leukemogenesis, and, therefore, may continue to serve as a therapeutic target. Finally, in patients with additional cytogenetic abnormalities who are resistant to imatinib mesylate, evaluation for levels of CRKL-phosphorylation should be done to sort out the nature of the resistance to this treatment and to understand the interplay between BCR/ABL-dependent and -independent mechanisms in disease progression. The results obtained with imatinib mesylate to date are truly impressive, but longer follow-up will be necessary to establish whether prevention or delay of blast crisis can be achieved and whether an improved overall survival for the majority of patients with CML can be obtained. It is clear that complete cytogenetic remission is achievable in most patients with CP CML, and that those who do not achieve this important end point between 3 and 6 months are likely to have a poor outcome. However, in patients with complete cytogenetic remission, other challenges remain. In these patients, for instance, molecular remission defined as the absence of BCR/ABL fusion transcript by RT-PCR is usually not achieved. The reasons for persistent low levels of residual disease after imatinib mesylate and the prognostic significance of these findings are unknown. It is possible that small numbers of mutated and resistant BCR/ABL-positive subclones remain essentially unaffected by this treatment, and if a proliferation advantage is subsequently acquired in these cells, they may drive disease recurrence. Therefore, in patients with complete cytogenetic remission, monitoring of the BCR/ABL fusion transcript levels by quantitative RT-PCR has been suggested to predict impending relapse, and if rising levels of BCR/ABL expression are detected, consideration could be given to alternative strategies including alloBMT. However, emerging data support the notion that hematologic or cytogenenetic remission can be achieved in imatinib-relapsed CP CML patients with higher doses of this agent. Kantarjian et al. reported on 54 patients with CML in CP who were initially treated with 400 mg of imatinib mesylate and, subsequently, with a higher dose (i.e., 800 mg) when hematologic or cytogenetic resistance or relapse developed (33) . Among 20 patients treated for hematologic resistance or relapse, 13 (65%) achieved CHR without complete cytogenetic remission, and among 34 patients treated for cytogenetic resistance or relapse, 19 (56%) achieved a complete cytogenetic remission or MCR. However, the mechanisms of resistance to standard dose were not evaluated in these patients and, therefore, correlation of these mechanisms with clinical response to the higher doses was not possible. Nevertheless, these data are intriguing and pose the question of whether a higher dose of imatinib mesylate could be used at the time of the initial diagnosis or during molecular relapse to prevent overt leukemia recurrence or blast transformation. Future studies will no doubt address these important issues. Regardless, it is undeniable that imatinib mesylate has changed our approach to CML and paved the way for additional molecular targeted strategies in leukemia. ↵1 Supported in part by P30-CA16058, and K08-CA90469 Grants from the National Cancer Institute, Bethesda, MD, The Elsa U. Pardee Cancer Research Foundation, and The Coleman Leukemia Research Foundation. ↵2 To whom requests for reprints should be addressed, at The Ohio State University, 458A Starling-Loving Hall, 320 West 10th Avenue, Columbus, OH 43210. Phone: (614) 293-7597; Fax: (614) 293-7527; E-mail: marcucci-1@medctr.osu.edu. ↵3 The abbreviations used are: CML, chronic myelogenous leukemia; Ph′, Philadelphia; ABL, Abelson; RT-PCR, reverse transcription-PCR; BM, bone marrow; CHR, complete hematologic remission; MCR, major cytogenetic response; alloBMT, allogeneic bone marrow transplantation; AGP, α1 glycoprotein; CP, chronic phase; AP, accelerated phase; BP, blastic phase. Clin. Cancer Res., 9: 1333–1337, 2003. Based on the results of a new study, researchers are developing a clinical trial to test imatinib (Gleevec) in patients with anaplastic large cell lymphoma (ALCL), an aggressive type of non-Hodgkin lymphoma that primarily affects children and young adults. The authors decided to investigate the effect of imatinib after finding a link between PDGFRB and a genetic abnormality that is found in many patients with ALCL. Previous work had shown that this genetic change—a translocation that leads to the production of an abnormal fusion protein called NPM-ALK—stimulates the production of two proteins, transcription factors called JUN and JUNB. In the new study, experiments in mice revealed that these proteins promote lymphoma development by increasing the levels of PDGFRB. Because imatinib inhibits PDGFRB, the authors tested the effect of the drug in mice with the NPM-ALK change and found that it improved their survival. They also found that imatinib given together with the ALK inhibitor crizotinib (Xalkori) greatly reduced the growth of NPM-ALK-positive lymphoma cells in mice. To test the treatment strategy in people, they identified a terminally ill patient with NPM-ALK-positive ALCL who had no other treatment options and agreed to try imatinib. The patient began to improve within 10 days of starting the therapy and has been free of the disease for 22 months, the authors reported. A planned clinical trial will be based on the expression of PDGFRB in tumors. Sawyers C. L. Chronic myeloid leukemia. N. Engl. J. Med., 340: 1330-1340,1999. Vardiman J. W., Harris N. L., Brunning R. D. The World Health Organization (WHO) classification of the myeloid neoplasms. Blood, 100: 2292-2302, 2002. Chronic Myeloid Leukemia Trialists’ Collaborative Group Interferon α versus chemotherapy for chronic myeloid leukemia: a meta-analysis of seven randomized trials. J. Natl. Cancer Inst., 89: 1616-1620, 1997. Horowitz M. M., Rowlings P. A., Passweg J. R. Allogeneic bone marrow transplantation for CML: a report from the International Bone Marrow Transplant Registry. Bone Marrow Transplant, 17 (Suppl.3): S5-S6, 1996. Clift R. A., Radich J., Appelbaum F. R., Martin P., Flowers M. E., Deeg H. J., Storb R., Thomas E. D. Long-term follow-up of a randomized study comparing cyclophosphamide and total body irradiation with busulfan and cyclophosphamide for patients receiving allogenic marrow transplants during chronic phase of chronic myeloid leukemia. Blood, 94: 3960-3962, 1999.
van Rhee F., Szydlo R. M., Hermans J., Devergie A., Frassoni F., Arcese W., de Witte T., Kolb H. J., Niederwiser D., Jacobsen N., Gahrton G., Bandini G., Carreras E., Bacigalupo A., Michallet M., Ruutu T., Reiffers J., Goldman J. M., Apperley J., Gratwohl A. Long-term results after allogeneic bone marrow transplantation for chronic myelogenous leukemia in chronic phase: a report from the Chronic Leukemia Working Party of the European Group for Blood and Marrow Transplantation. Bone Marrow Transplant, 20: 553-560, 1997. Druker B. J., Sawyers C. L., Kantarjian H., Resta D. J., Reese S. F., Ford J. M., Capdeville R., Talpaz M. Activity of a specific inhibitor of the BCR-ABL tyrosine kinase in the blast crisis of chronic myeloid leukemia and acute lymphoblastic leukemia with the Philadelphia chromosome. N. Engl. J. Med., 344: 1038-1042,2001. Van Etten R. A. Studying the pathogenesis of BCR-ABL+ leukemia in mice.Oncogene, 21: 8643-8651, 2002. Pane F., Intrieri M., Quintarelli C., Izzo B., Muccioli G. C., Salvatore F. BCR/ABL genes and leukemic phenotype: from molecular mechanisms to clinical correlations. Oncogene, 21: 8652-8667, 2002. Faderl S., Talpaz M., Estrov Z., O’Brien S., Kurzrock R., Kantarjian H. M. The biology of chronic myeloid leukemia. N. Engl. J. Med., 341: 164-172, 1999. Zou X., Calame K. Signaling pathways activated by oncogenic forms of Abl tyrosine kinase. J. Biol. Chem., 274: 18141-18144, 1999. Perrotti D., Calabretta B. Post-transcriptional mechanisms in BCR/ABL leukemogenesis: role of shuttling RNA-binding proteins. Oncogene, 21: 8577-8583,2002. Trotta R., Vignudelli T., Candini C., Intine R., Pecorari L., Guerzoni C., Santilli G., Byrom B., Goldoni G., Ford L., Caligiuri M., Maraia R., Perrotti D., Calabretta B. BCR/ABL activates mdm2 mRNA translation via the La antigen. Cancer Cell, 3:145-160, 2003. Osarogiagbon U. R., McGlave P. B. Chronic myelogenous leukemia. Curr. Opin. Hematol., 6: 241-246, 1999. Gordon M. Y. Biological consequences of the BCR/ABL fusion gene in humans and mice. J. Clin. Pathol., 52: 719-722, 1999. Druker B. J. Imatinib alone and in combination for chronic myeloid leukemia.Semin. Hematol., 40: 50-58, 2003. Sawyers C. L., Hochhaus A., Feldman E., Goldman J. M., Miller C. B., Ottmann O. G., Schiffer C. A., Talpaz M., Guilhot F., Deininger M. W., Fischer T., O’Brien S. G., Stone R. M., Gambacorti-Passerini C. B., Russell N. H., Reiffers J. J., Shea T. C., Chapuis B., Coutre S., Tura S., Morra E., Larson R. A., Saven A., Peschel C., Gratwohl A., Mandelli F., Ben-Am M., Gathmann I., Capdeville R., Paquette R. L., Druker B. J. Imatinib induces hematologic and cytogenetic responses in patients with chronic myelogenous leukemia in myeloid blast crisis: results of a phase II study. Blood, 99: 3530-3539, 2002. Kantarjian H., Sawyers C., Hochhaus A., Guilhot F., Schiffer C., Gambacorti-Passerini C., Niederwieser D., Resta D., Capdeville R., Zoellner U., Talpaz M., Druker B., Goldman J., O’Brien S. G., Russell N., Fischer T., Ottmann O., Cony-Makhoul P., Facon T., Stone R., Miller C., Tallman M., Brown R., Schuster M., Loughran T., Gratwohl A., Mandelli F., Saglio G., Lazzarino M., Russo D., Baccarani M., Morra E. Hematologic and cytogenetic responses to imatinib mesylate in chronic myelogenous leukemia. N. Engl. J. Med., 346: 645-652, 2002. Talpaz M., Silver R. T., Druker B. J., Goldman J. M., Gambacorti-Passerini C., Guilhot F., Schiffer C. A., Fischer T., Deininger M. W., Lennard A. L., Hochhaus A., Ottmann O. G., Gratwohl A., Baccarani M., Stone R., Tura S., Mahon F. X., Fernandes-Reese S., Gathmann I., Capdeville R., Kantarjian H. M., Sawyers C. L. Imatinib induces durable hematologic and cytogenetic responses in patients with accelerated phase chronic myeloid leukemia: results of a phase 2 study. Blood, 99:1928-1937, 2002. Druker B. J., O’Brien S. G., Cortes J., Radich J. Chronic myelogenous leukemia. Hematology (Am. Soc. Hematol. Educ. Program), : 111-135, 2002. Gorre M. E., Ellwood-Yen K., Chiosis G., Rosen N., Sawyers C. L. BCR-ABL point mutants isolated from patients with imatinib mesylate-resistant chronic myeloid leukemia remain sensitive to inhibitors of the BCR-ABL chaperone heat shock protein 90. Blood, 100: 3041-3044, 2002. Gambacorti-Passerini C. B., Gunby R. H., Piazza R., Galietta A., Rostagno R., Scapozza L. Molecular mechanisms of resistance to imatinib in Philadelphia-chromosome-positive leukaemias. Lancet Oncol., 4: 75-85, 2003. Elmaagacli A. H., Beelen D. W., Opalka B., Seeber S., Schaefer U. W. The amount of BCR-ABL fusion transcripts detected by the real-time quantitative polymerase chain reaction method in patients with Philadelphia chromosome positive chronic myeloid leukemia correlates with the disease stage. Ann. Hematol., 79: 424-431, 2000. Perrotti D., Cesi V., Trotta R., Guerzoni C., Santilli G., Campbell K., Iervolino A., Condorelli F., Gambacorti-Passerini C., Caligiuri M. A., Calabretta B. BCR-ABL suppresses C/EBPα expression through inhibitory action of hnRNP E2. Nat. Genet., 30: 48-58, 2002. Honda H., Ushijima T., Wakazono K., Oda H., Tanaka Y., Aizawa S., Ishikawa T., Yazaki Y., Hirai H. Acquired loss of p53 induces blastic transformation in p210(bcr/abl)-expressing hematopoietic cells: a transgenic study for blast crisis of human CML. Blood, 95: 1144-1150, 2000. Skorski T., Nieborowska-Skorska M., Wlodarski P., Perrotti D., Martinez R., Wasik M. A., Calabretta B. Blastic transformation of p53-deficient bone marrow cells by p210bcr/abl tyrosine kinase. Proc. Natl. Acad. Sci. USA, 93: 13137-13142,1996. Hochhaus A., Kreil S., Corbin A. S., La Rosee P., Muller M. C., Lahaye T., Hanfstein B., Schoch C., Cross N. C., Berger U., Gschaidmeier H., Druker B. J., Hehlmann R. Molecular and chromosomal mechanisms of resistance to imatinib (STI571) therapy. Leukemia (Baltimore), 16: 2190-2196, 2002. O’Dwyer M. E. Chronic myelogenous leukemia. Curr. Opin. Oncol., 15: 10-15,2003. Mohamed A. N., Pemberton P., Zonder J., Schiffer C. A. The effect of imatinib mesylate on patients with philadelphia chromosome-positive chronic myeloid leukemia with secondary chromosomal aberrations. Clin. Cancer Res., 9: 00-00,2003. Schoch C., Haferlach T., Kern W., Schnittger S., Berger U., Hehlmann R., Hiddemann W., Hochhaus A. Occurrence of additional chromosome aberrations in chronic myeloid leukemia patients treated with imatinib mesylate. Leukemia (Baltimore), 17: 461-463, 2003. Cortes J. E., Talpaz M., Giles F., O’Brien S., Rios M. B., Shan J., Garcia-Manero G., Faderl S., Thomas D. A., Wierda, W., Ferrajoli A., Jeha S., Kantarjian H. M. Prognostic significance of cytogenetic clonal evolution in patients with chronic myelogenous leukemia on imatinib mesylate therapy. Blood, : 2003. Kantarjian H. M., Talpaz M., O’Brien S., Giles F., Garcia-Manero G., Faderl S., Thomas D., Shan J., Rios M. B., Cortes J. Dose escalation of imatinib mesylate can overcome resistance to standard-dose therapy in patients with chronic myelogenous leukemia. Blood, 101: 473-475, 2003.